I spent some time this weekend trying to figure out how to work the A-Z April challenge posts into my blog on a daily basis. Some days I may just answer the challenge, some days I'll tack the challenge onto other news (like today) and some days I may put out two separate posts. I am going to continue hosting the Wednesday Hodgepodge because that's something I really enjoy. Those questions have also been floating around in my brain, frequently colliding with the A-Z ideas I've been considering. My head has been full of a lot of words this weekend people. Hubs might be happy he was traveling. On the bright side, since hubs was away again I don't really have anything too exciting to share. Oh wait...the tile guy was here all day Friday and Saturday. Whoohoo! That may not be exciting to you but it's pretty exciting to me. He's finally got some tile on the wall now and we are really happy with our selection. He also repaired the ding in the hall ceiling and did a remarkable job. I think I might be able to live with a repair after all. This was a day trip so my description might be brief. And doesn't the sky in this photo look fake? 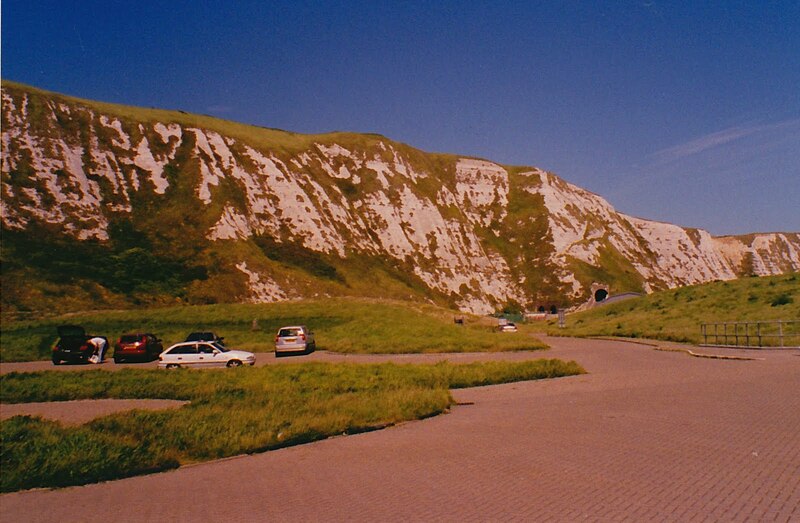 We made our way to Canterbury via the White Cliffs of Dover. They're chalk which explains the color and seeing them up close and personal was something hubs really wanted to do while living in the UK. One sunny day back in May 2005 we loaded up the car with our dog and our teenagers (yes kids, we're going to see 'more rocks'), and we drove to County Kent. Let me tell you-the sun may have been shining but it was windy. Oh my word, the wind! Wind does not make for attractive photographs. Standing beside the choppy English Channel a couple of thoughts came to mind the first one being- so glad I'm not on a ferry to France! Seriously...look at those whitecaps. 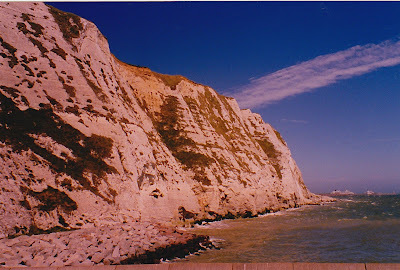 I also found myself, much to my kids dismay, singing an old song written during WWII called The White Cliffs of Dover . 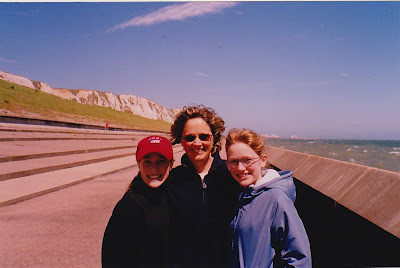 Hey, I was standing right in front of the White Cliffs of Dover...how could I not sing? Only the chorus though, because that's all I knew. Until we moved overseas I wasn't all that interested in understanding the battles fought in WWII. That changes when you stand on the ground where soldiers died and you climb inside a Nazi bunker on a beach in France and you walk thru a cave carved into the Dover hillside. Suddenly that war and what it required in terms of sacrifice and courage and what it gave us in the way of freedom becomes personal and very real. I may have sung that chorus all the live long day. Since it was so windy we decided to carry on down the road to Canterbury, home to the Church of England and one of the world's most magnificent cathedrals. 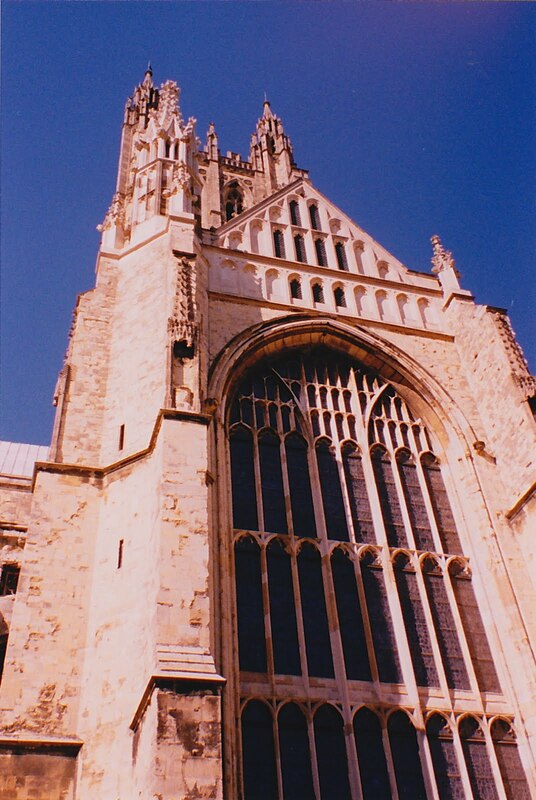 It was in this cathedral in 1170 that Archbishop Thomas Becket was murdered. The dates are something that never cease to amaze. 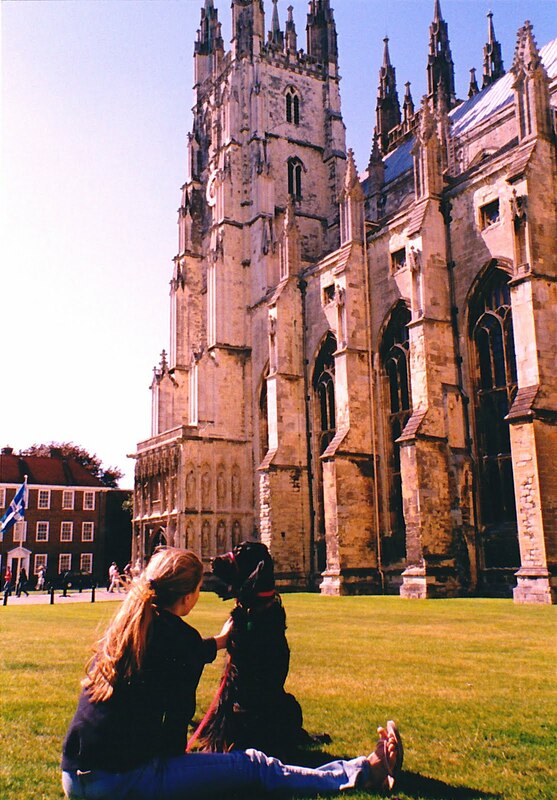 The cathedral is part of a World Heritage site and of course its also the setting for Chaucer's Canterbury Tales. Did you read that in high school? In the Middle English language? Did you buy the CliffsNotes? Are you wishing there were CliffsNotes for my blog so you could read the condensed version? I get it...I'll hush now. If you get to England don't bypass the sights and scenery of County Kent. Even dogs and teenagers would say that's true. If you'd like to join the blog challenge click the A-Z button on my sidebar for info and linking. I'm constantly amazed at all of the sights you've seen in your travels, and you have such a way with words, too! Love England and the historical sights that crop up just about everywhere. What wonderful memories you all must have. I would like to get back over there someday. Until then, I will see it on your blog! Traveling around the world I am always amazed at America's sheer youth in this world of ours. Lovely pictures. 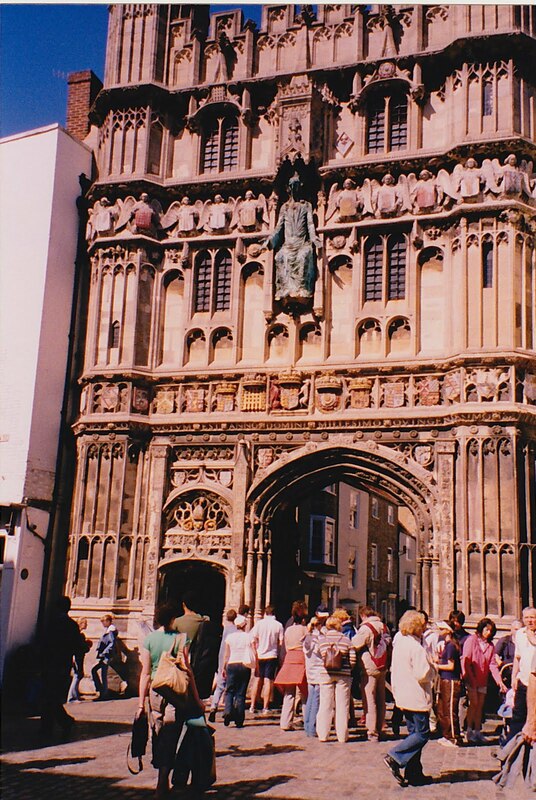 I too, loved Canterbury and Dover. Hubby was stationed in England and we were not far from Wells By The Sea so we went there a lot! Loved our time in England. Lived off base for a bit in a 2 story apartment with a WC on the first floor with master bedroom and no heat! 2nd floor had kitchen, living room with fireplace (Source of heat) and kids bedroom. It was great! Beautiful country and beautiful people. Glad the patch work looks great and looking forwarded to the hodgepodge. Beautiful I wish we made it there on our several visits to the UK...pictures are amazing. What a wonderful experience your family has had and the memories. Have a wonderful Monday! Wow ... beautiful. 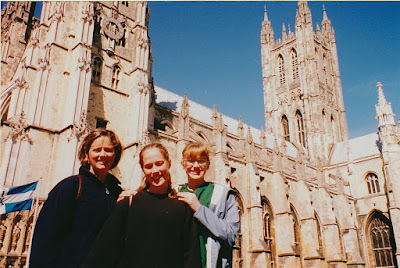 Going to Europe is on my bucket list, but since DH & I hate to fly, I'll "settle" for seeing it here on your blog. I wonder what you'll share for "D". P.S. You *do* have such a way with words ... I never feel like I want the Cliff Notes version! ha! The cliffs and the cathedral are beautiful! And I'm with you -- the ancient history of England is truly mind-boggling. Gorgeous!!! I would have been singing too - I mean - how can you not!! I know what you mean about standing on the site where so many people died. I've never been to any outside of Texas - but I can tell you, standing inside the Alamo brings the whole Texas Revolution alive. Amazing! Thank you for sharing! Great C post! I love this. May I have my children simply read your post and call history done for the day? ;) And yes, wind is not my friend when taking portraits, but you gals look beautiful. Living through your travels again. Amazing! The church, the rocks and the sky. Amazing! You have a lot going on. So glad you like your tile and that you can live with the repair! Can't wait to see pictures of the new bathroom. A wonderful new week to you! I would have been singing about the white cliffs too... and my kids probably would have been embarrassed, but they're used to it. The cathedral photos bring to mind the book, The Pillars of the Earth. It is amazing to think about the building of those magnificent structures! What gorgeous snaps and what a lot I learned. I've only seen these cliffs from a distance and they looked spectacular then, but having a closer view is great. I love that cathederal. What lovely colours. It is special knowing this is related to the wonderful Canterbury Tales. When I become filthy rich (don't hold your breath) I am totally going to take you up on that and make you take me to the city!